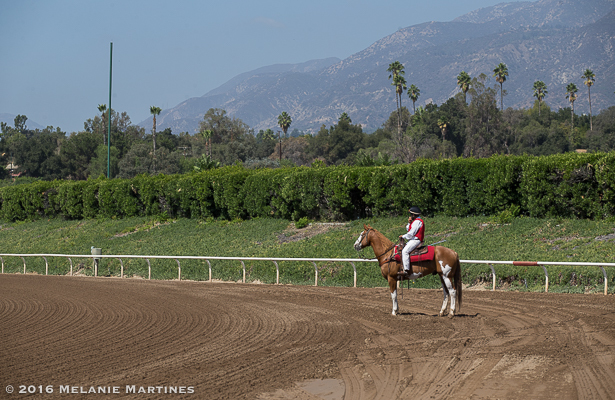 It's always nice to be back at Santa Anita Park and the view never gets old! 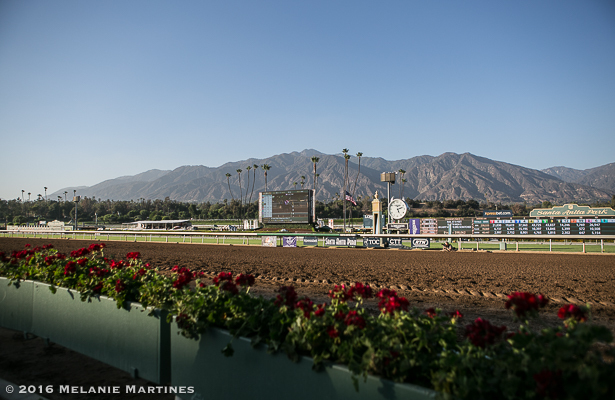 Last Friday marked the start of the 23-day Autumn Meet, and I couldn't be more excited to be back at The Great Race Place. 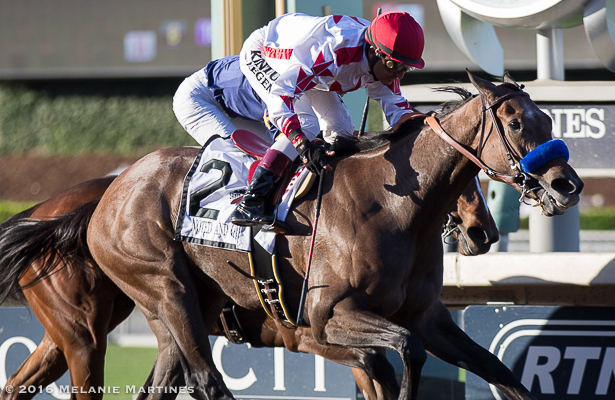 Last Saturday was a thrilling day, with five Grade 1, Breeders' Cup "Win and You're In" Challenge races. 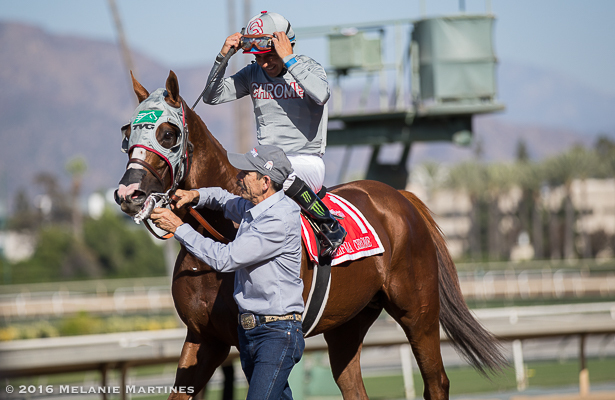 Undoubtedly the best horse in training, California Chrome was ready to face Dortmund once again in the Awesome Again Stakes, and top mare Beholder was back seeking her fourth consecutive win in the Zenyatta Stakes, with razor sharp 4-year-old Stellar Wind ready to stop her. The race card was filled with a star-studded cast that sprinkled excitement in the air, and a promise for an unforgettable day. 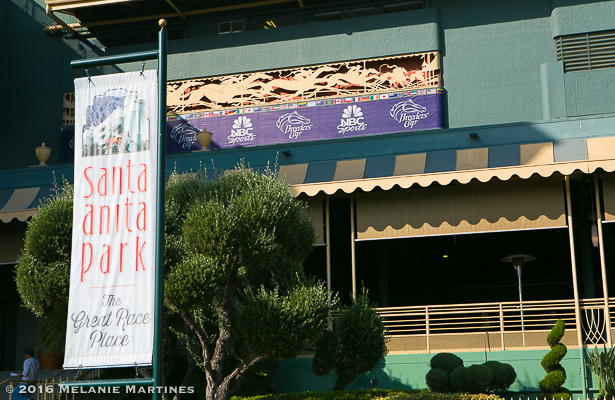 Welcome to the beautiful Santa Anita Park, the host to this year's Breeders' Cup World Championship! 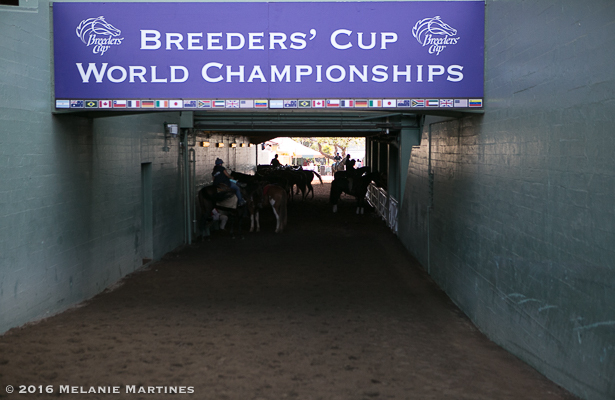 It's so exciting to see the presence of the Breeders' Cup throughout the race track. It was a beautiful day in Southern California! 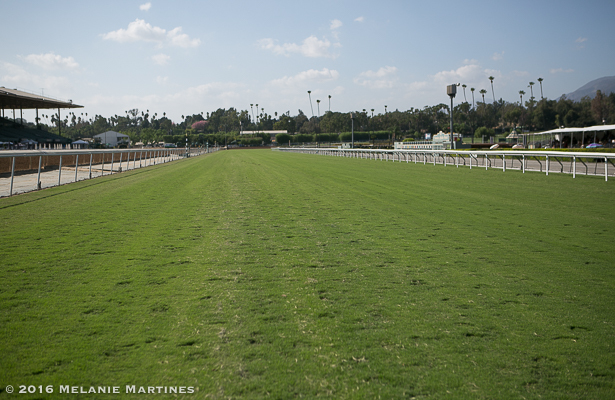 First thing I noticed was the newly installed turf course. A Bermuda-Bandera blend that was installed in June. There's a cushiony-feel that has a nice spring to it. Feels really nice. 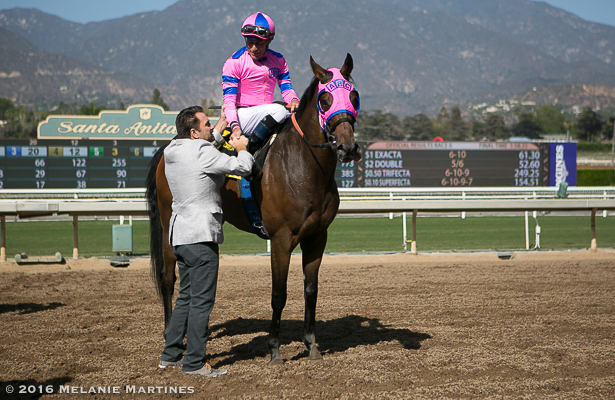 Jockey Victor Espinoza had an amazing day winning 4 races of which, 3 were Graded 1's. His first win of the day was in Race 5 with first-time turf starter Hootie. The colt chased an honest pace and came flying late and paid a whooping $20.20 for the win. 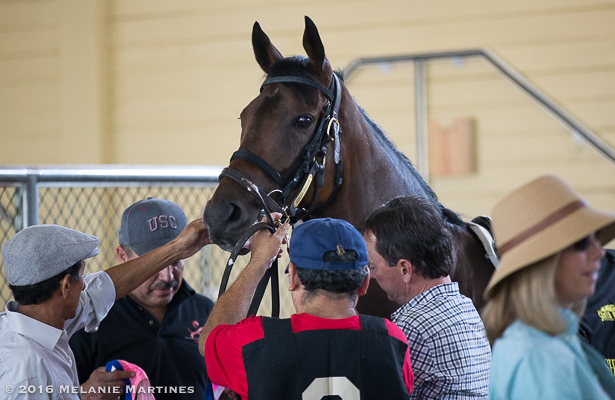 The strapping 2-year-old colt by Candy Ride is trained by Michael McCarthy. 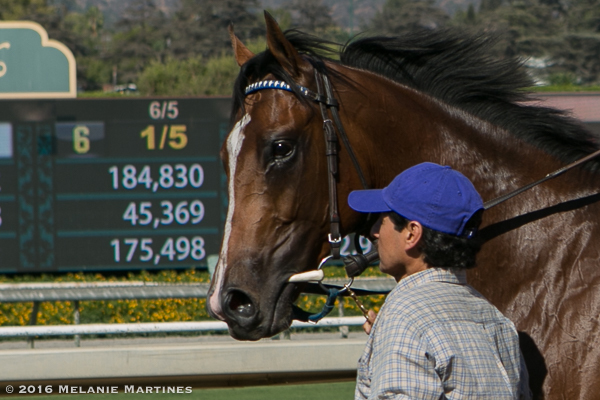 I'd keep this colt on your radar, I'm sure we will be hearing more about him in the near future. 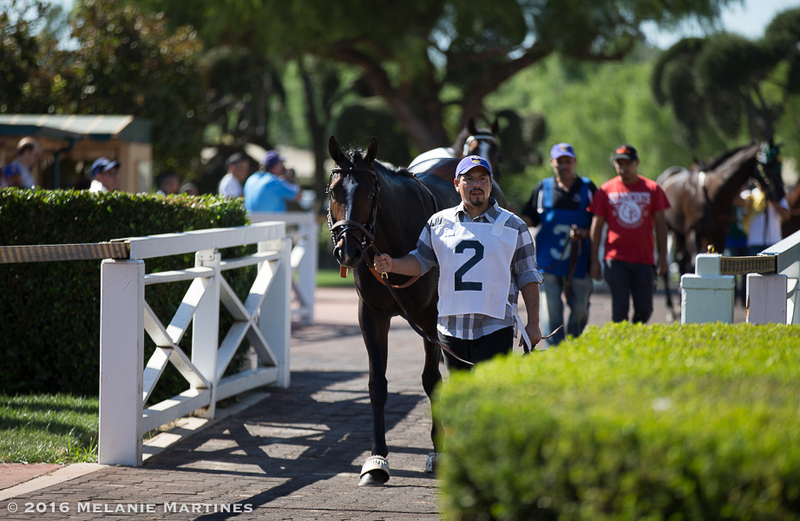 Unfortunately, I was unable to shoot the race because I was in the paddock area at that time, but I was able to get a photo of him prior to the race. If you haven't seen the race, I'd check out the replay. 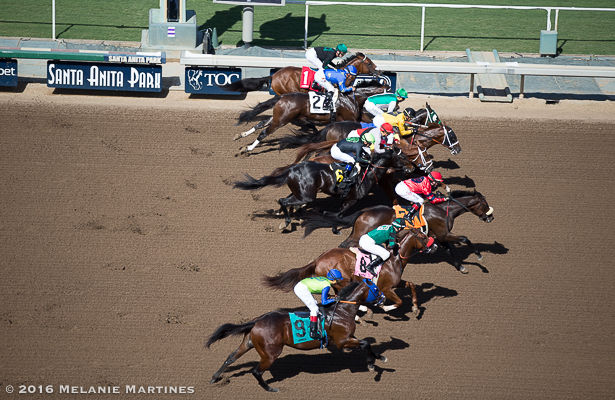 Graded stakes action started in Race 6 with the Grade 1 FrontRunner Stakes. 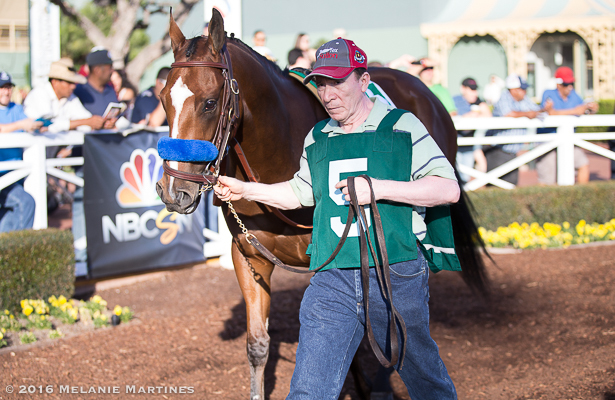 Here's Gormley headed toward the paddock area. #2 Plum Daddy by Medaglia d'Oro. 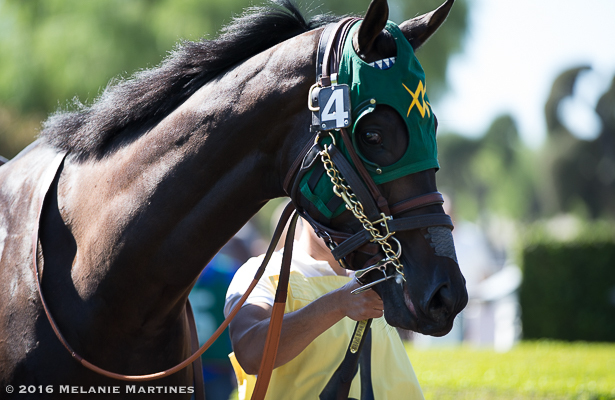 A close up of beautiful Midnight Pleasure. 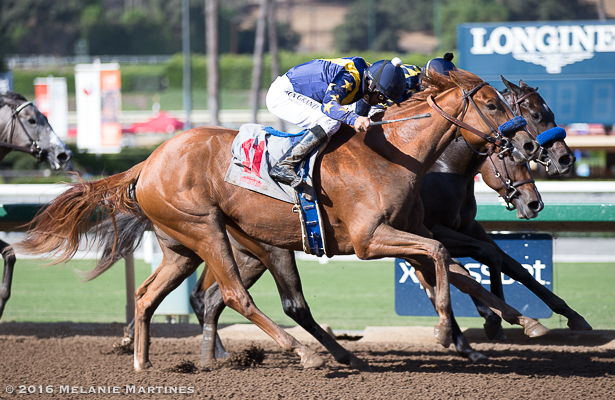 #3 Secret House broke out of the gate without his jockey Santiago Gonzalez. The gate had opened while the jockey was unseated and the colt was declared a non-starter because of this. Luckily no one was injured due to this incident. 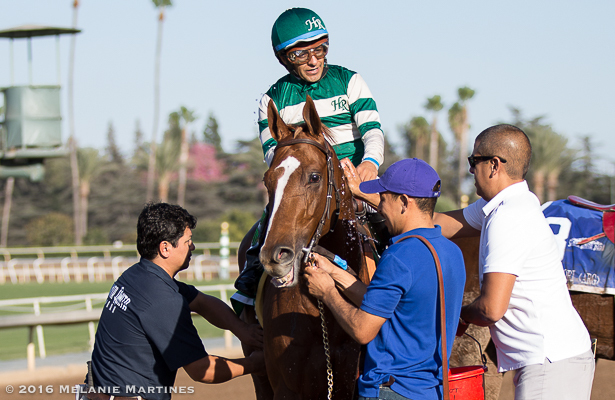 Gormley, guided by jockey Victor Espinoza stayed on the inside running a solid race going wire-to-wire in his stakes debut. 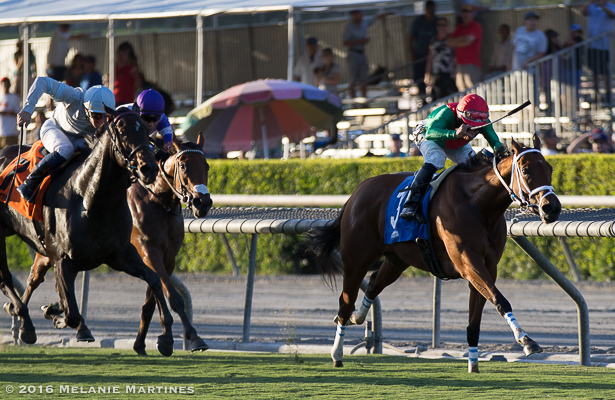 An upset in the FrontRunner Stakes, as Gormley paid $23.60 for the win. Receiving a 96 Beyer speed figure, this 2-year-old colt is not only skilled and talented but he is also light on his feet. Favorite Klimt broke a little slowly out of the gate which put him in a bad position, leaving him a little more to do than he wanted. 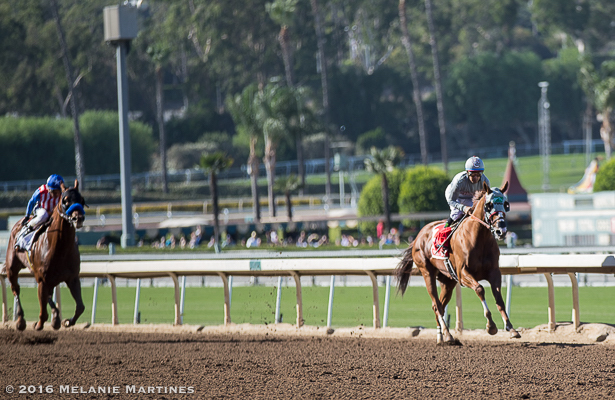 He was closing on a race track that wasn't very kind to horses running off the pace. He still managed to rally for second making up ground. Second favorite was Straight Fire who came in third. 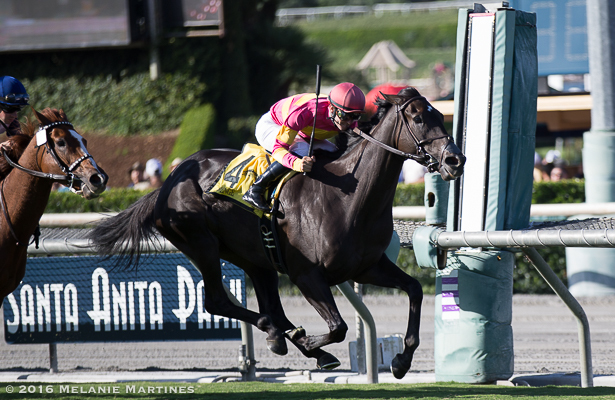 Gormley with a "Win and You're In" stamps himself a ticket in the Breeders' Cup Juvenile division. 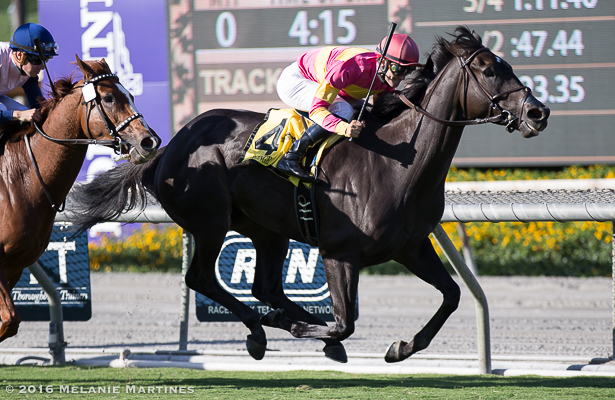 Trainer John Shirreffs on Gormley, "He's a horse that has enough focus and ambition to always go forward". 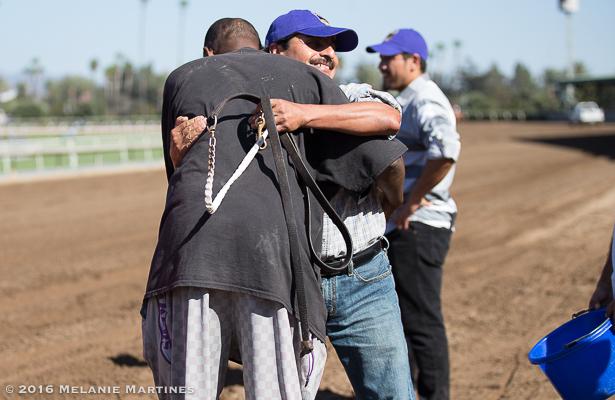 Gormley's groom getting a celebratory hug. 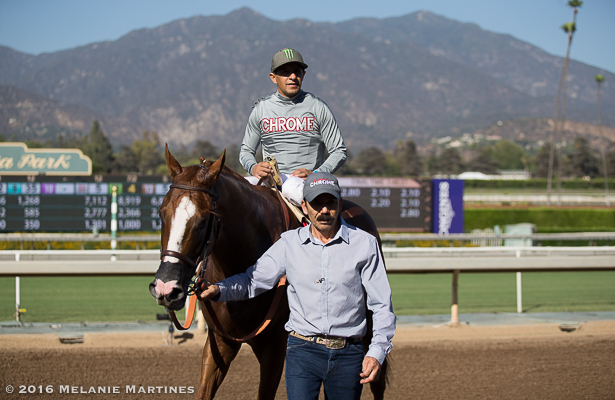 John Shirreffs, "He has always been a horse that's happy about what he's doing". 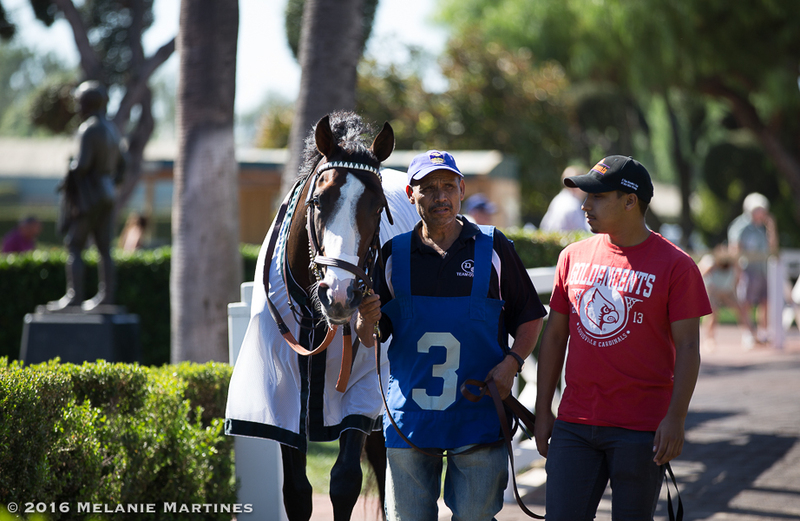 Here's the champ in the paddock area with Groom Raul Rodriguez all smiles with exercise rider Dihiji Gladney. 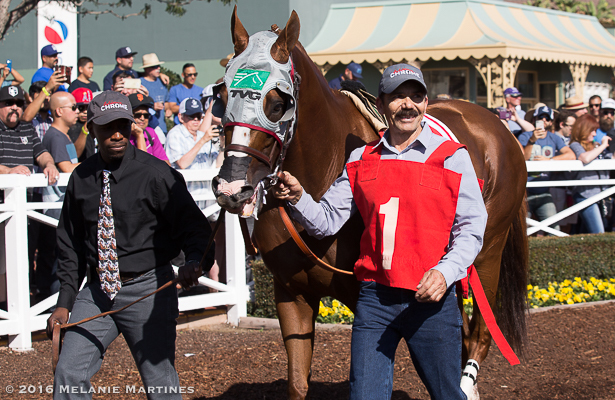 California Chrome in the post parade looking fabulous! 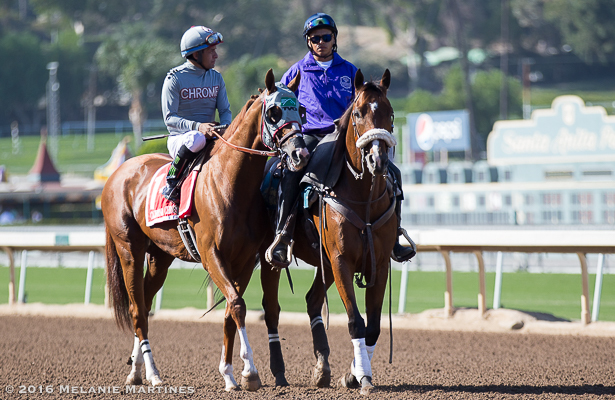 Dortmund breathing down California Chrome's neck, and not letting him out of his sight. 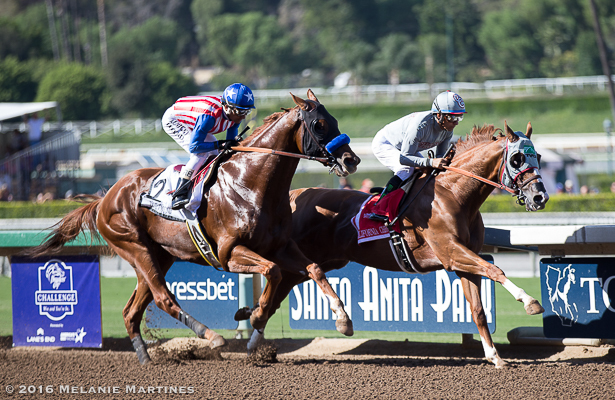 Look at how big Dortmund is compared to California Chrome. Dortmund racing in blinkers for the very first time could just not keep up with the Champ. 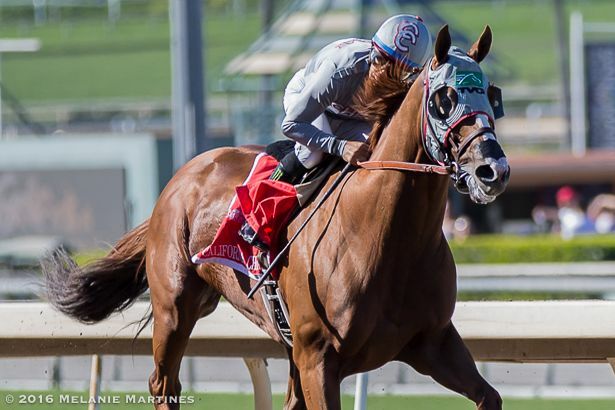 They went 1-2 through the backstrech, but at the half mile pole California Chrome began separating himself from Dortmund who just could not keep up. 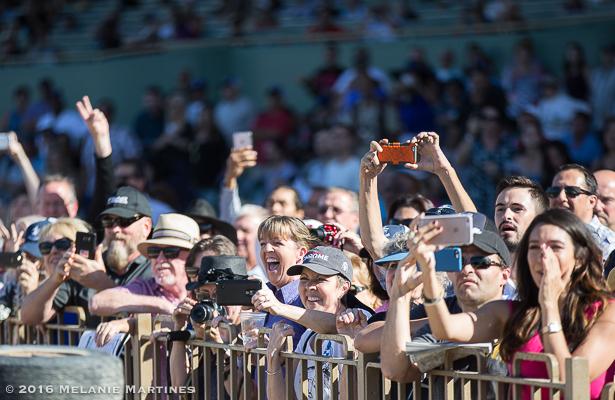 The race fans cheering Chrome home. 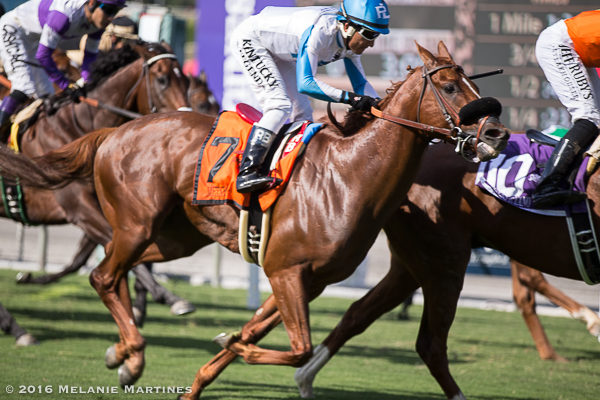 Jockey Victor Espinoza cantered the "World's Top Ranked Racehorse" to an easy victory, earning a 112 Beyer Speed Figure. All smiles as the dynamic duo cross the finish line. 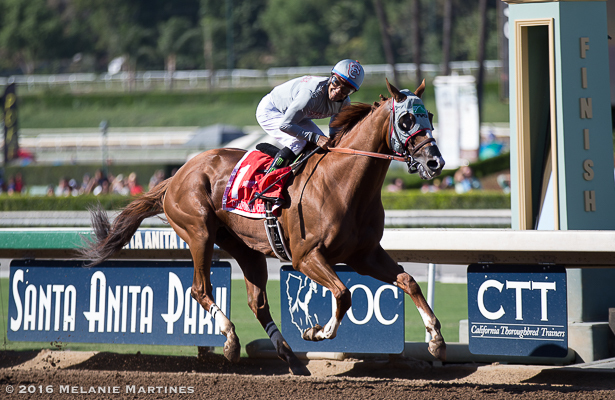 California Chrome continues to amaze us all with a perfect record for the year. 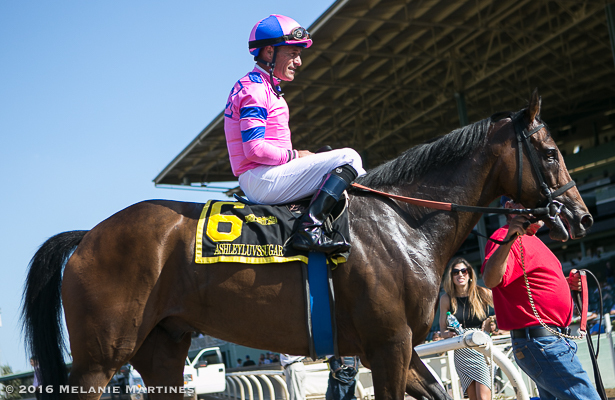 He's now won 15 times in 24 starts with a career bankroll of more than $13.4 million! Cheers to Monster. It's the perfect setting, since Chrome is a beast! 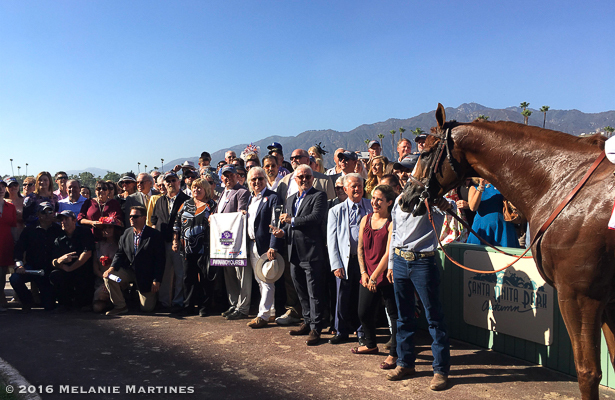 All eyes on the Champ in the winner's circle. 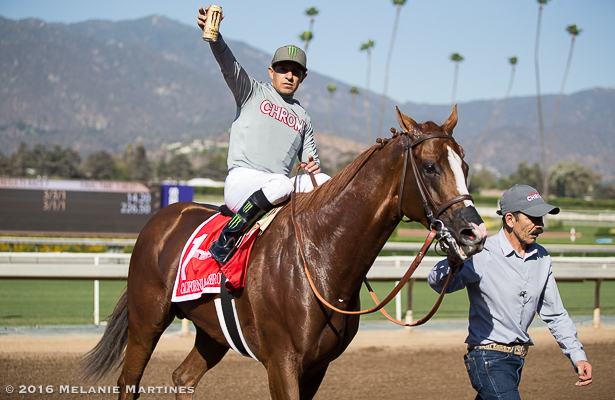 All hail to California Chrome the richest racehorse in the world! 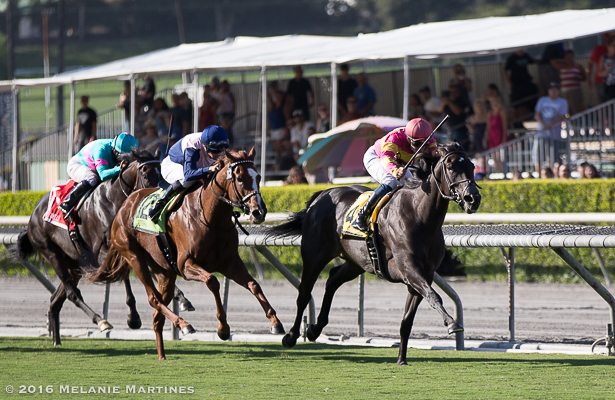 Race 8 was the Grade 1 Rodeo Drive Stakes. 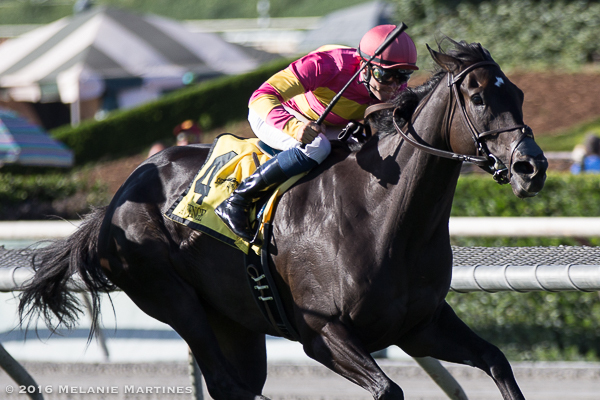 Avenge led the way in the 1 1/4 on the turf. No pressure on the front end, but was shadowed the entire way by #12 Zipessa. Having an easy lead throughout the race, Zipessa challenges #4 Avenge in the stretch run, but the front runner is just too good. Jockey Flavien Prat, "She's getting better with each race. She really surprised me out there today. Once I let go she really got comfortable and took the lead. 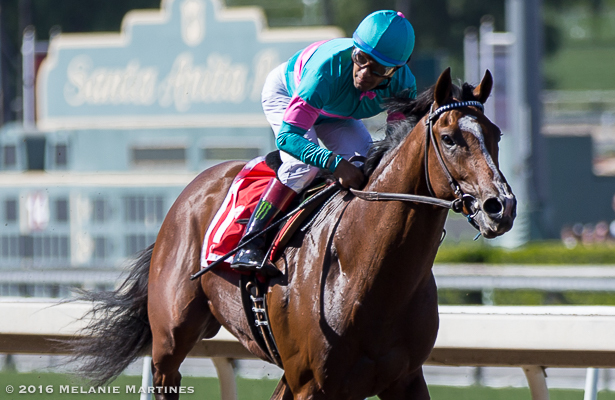 Honestly, that was a lot of fun and we'll see how she does for the Breeders' Cup; it's a big one." 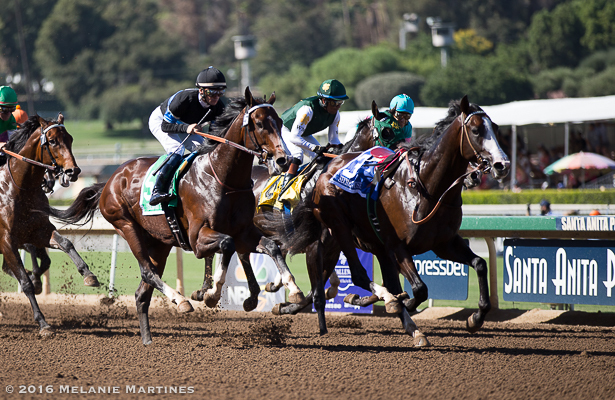 Race 9 was the Grade 1 Zenyatta Stakes. 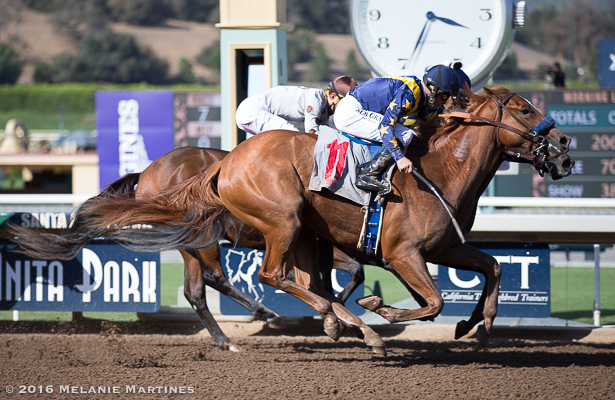 Champion Mare, Beholder was seeking her fourth consecutive victory in this race, but once again was denied by Stellar Wind, who just seems to be getting better and better with each race. 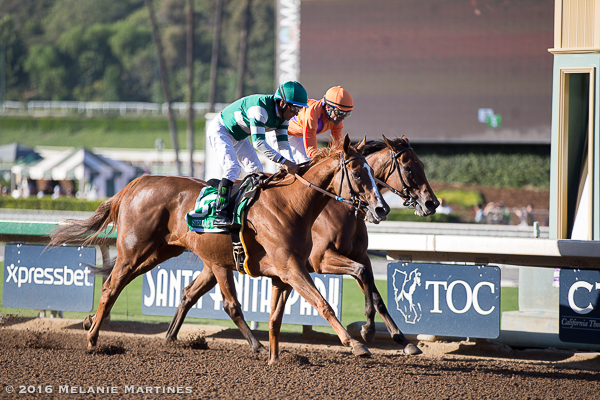 Beholder sped to the early lead setting a pressured pace off the rail as Stellar Wind prompted the pace. 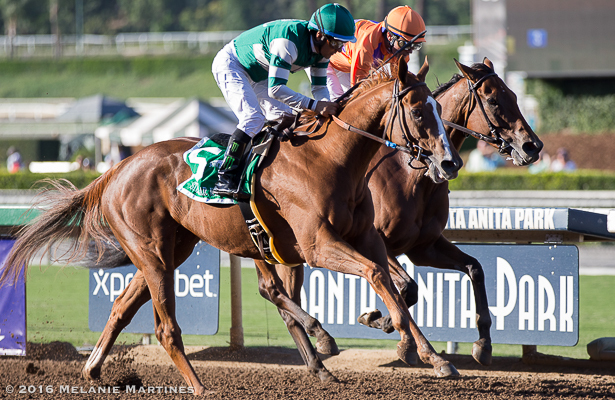 At the top of the stretch, Stellar Wind took the outside of Beholder and made her move, gaining a short lead and held gamely to win by a neck. 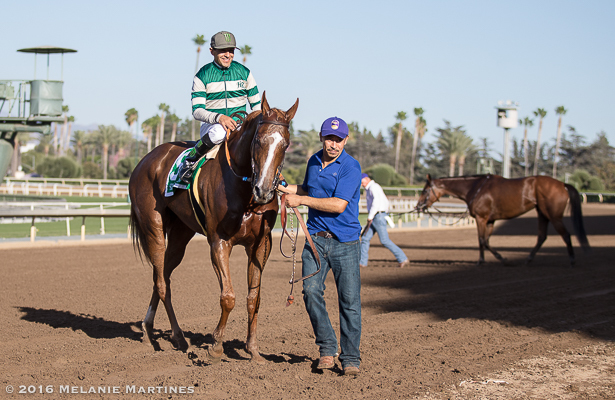 In the midst of a battle toward the wire, Stellar Wind manages to take a quick peak at the cameras. In fact my camera catches her the entire way looking comfortable with her ears perked up peaking to the right of her as she is crossing the finish line. She earns a spectacular 110 Beyer Speed Figure for her efforts! 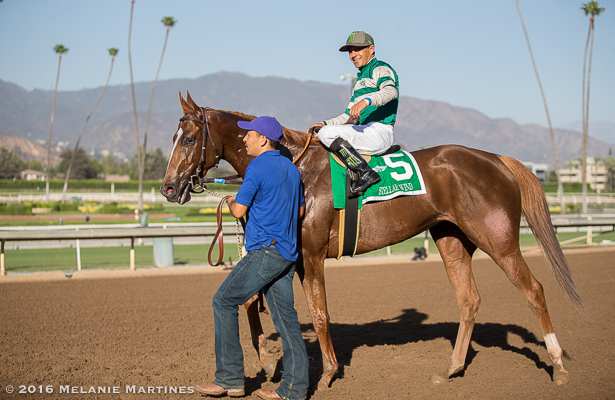 It's a "Win and You're In" for Stellar Wind who had already stamped herself a ticket to the Breeders' Cup Distaff after winning the Clement L. Hirsch Handicap back in July. 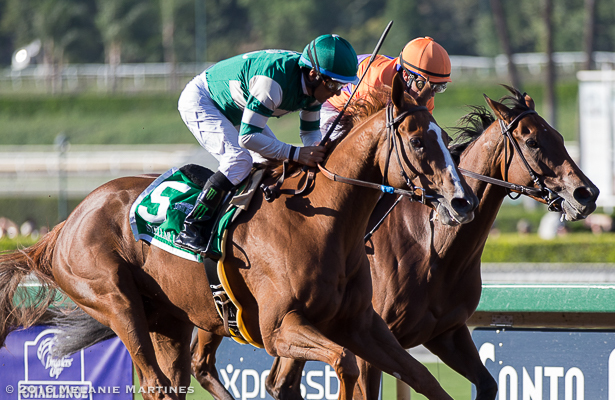 The Daughter of Curlin continues to shine, making this her second victory over Beholder. 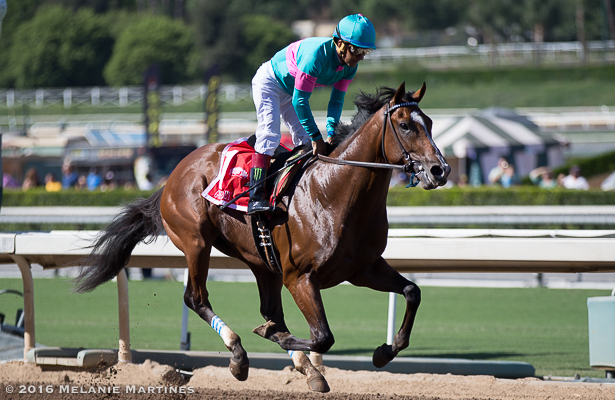 A great day for Victor Espinoza, winning three Grade 1 races. 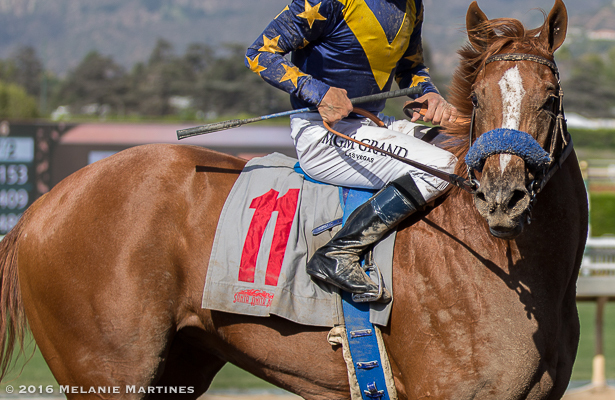 Race 10 was the Grade 1 Chandelier Stakes for 2-year-old-fillies. 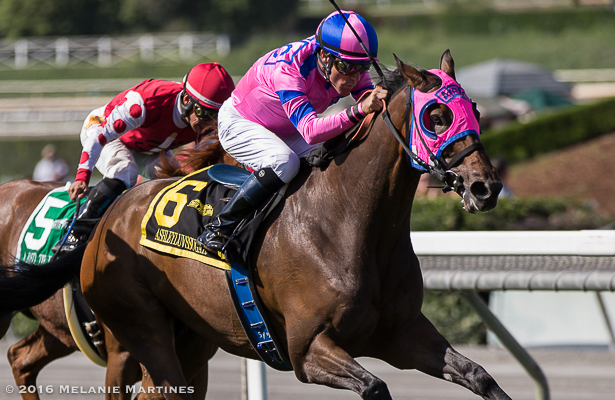 A "Win and You're In" for the Juvenile Fillies division. 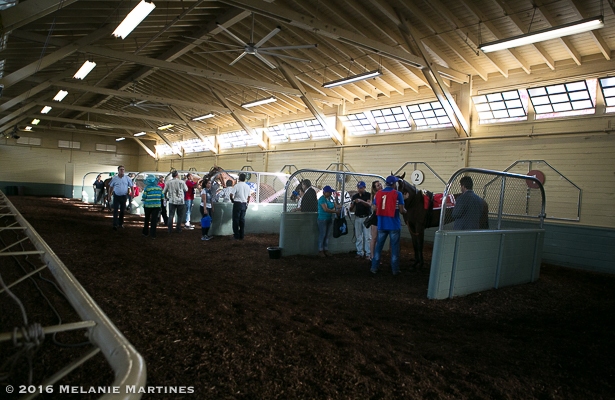 Here is part of the field in the saddling area. I couldn't wait to finally see the full sister to American Pharoah. 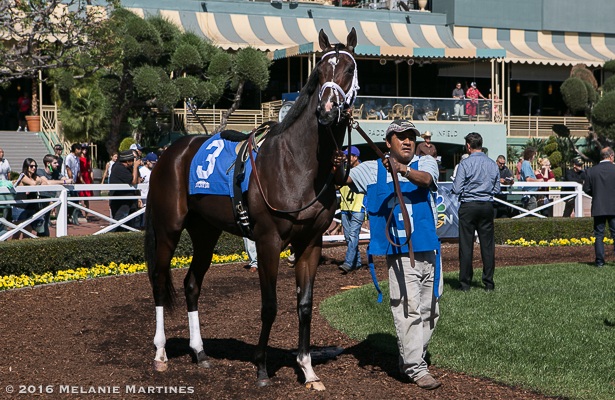 Here is American Cleopatra in the paddock area. She had some early speed in the race, but eventually dropped back in the second turn, had little left in the stretch, and finished toward the back of the field. And they're off in the Chandelier Stakes! Noted and Quoted tracked the early leader, With Honors, throughout most of the race. Turning for home at the three-sixteenth pole, the daughter of The Factor surged past With Honors to win the Grade 1 Chandelier Stakes! Noted and Quoted looks a lot like her sire, The Factor, in his earlier days. I love the name, Noted and Quoted! Another longshot paying $16.80 for the win, with the favorite Zapperkat coming in third. 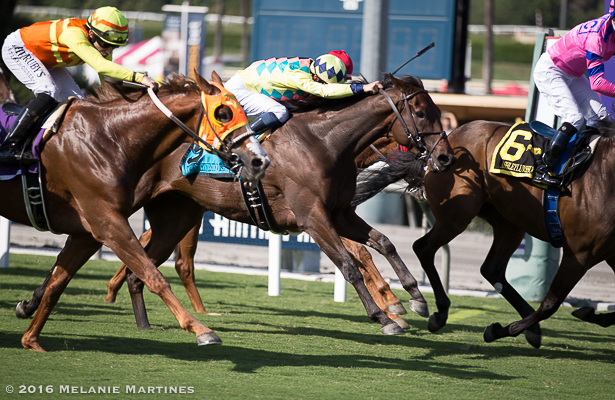 The final race of the day was the Unzip Me Stakes for 3-year-old fillies, with Belvoir Bay victorious on the downhill turf course paying $14.80 for the win! 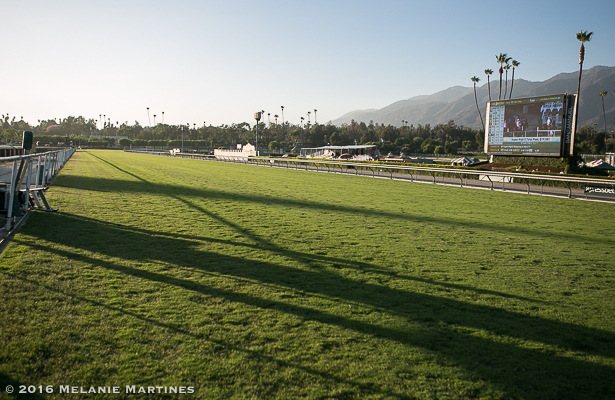 What a spectacular day of racing! 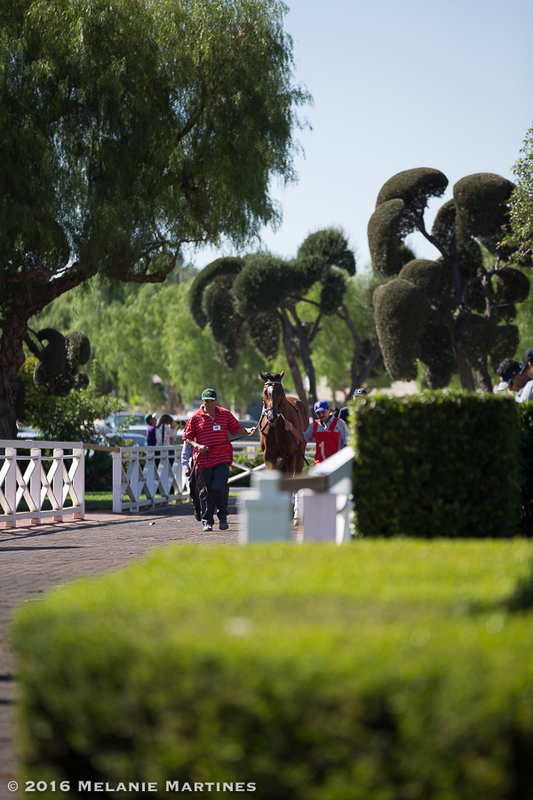 Sunday was another beautiful morning at the race track! Here is Race 1 as they came around the turn (just a different view). 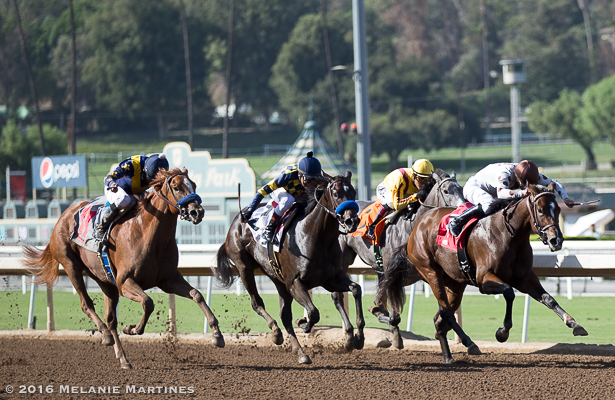 In Race 2 got up close to the gate in a 7F race. I got an aerial shot of Race 5 from the Press Box. 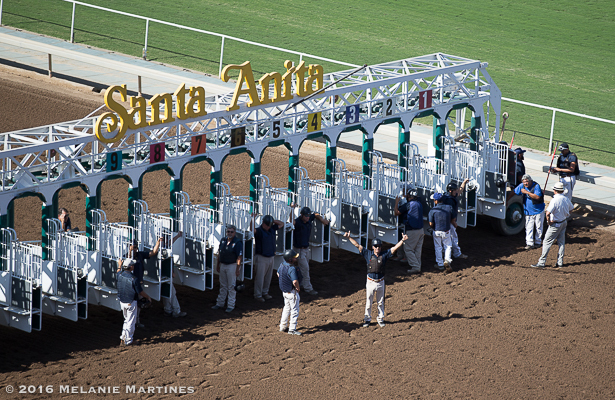 Here is the gate crew waiting on the horses. Looks like someone saw my big lens! Just a different view of the race breaking from the gate. 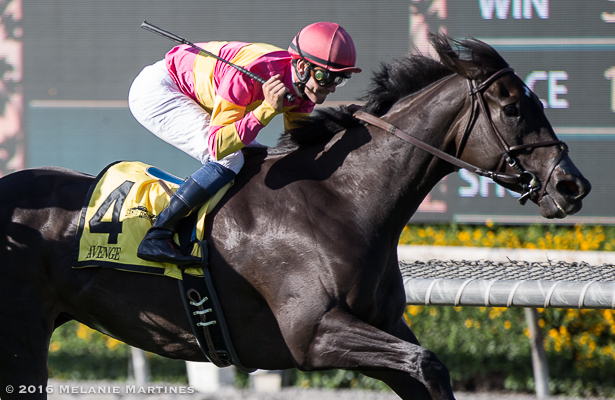 There was only one graded stakes race on Sunday, the Grade 2 John Henry Turf Championship. 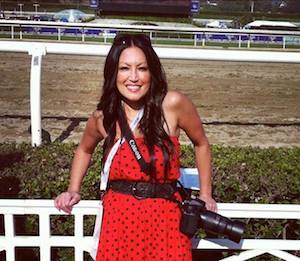 Here is Ashleyluvssugar in the saddling area. 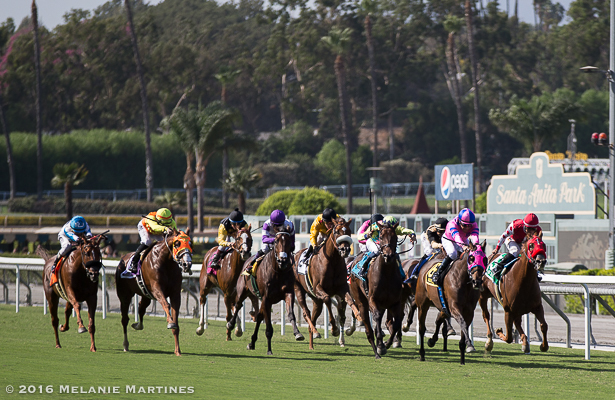 The full field in the stretch run, with Ashleyluvssugar in the lead. 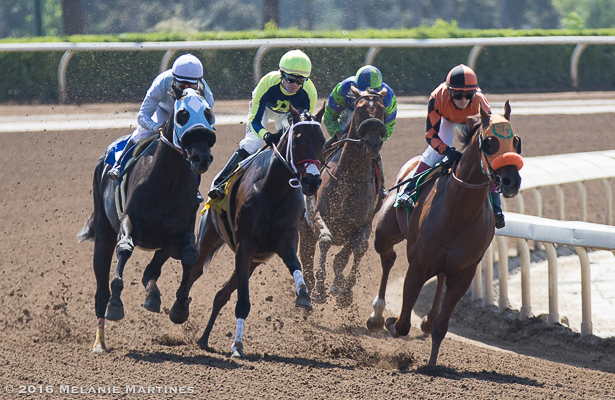 Texas Ryano in the orange blinkers, and Twentytwentyvision digging deep to catch #6 Ashleyluvssugar. Both coming in second and third respectfully. Favorite Metaboss, came out on the second turn and went three deep into the stretch, before angling out in the upper stretch and managed to finish fourth. Ashleyluvssugar looking majestic turning for home. What a beauty! 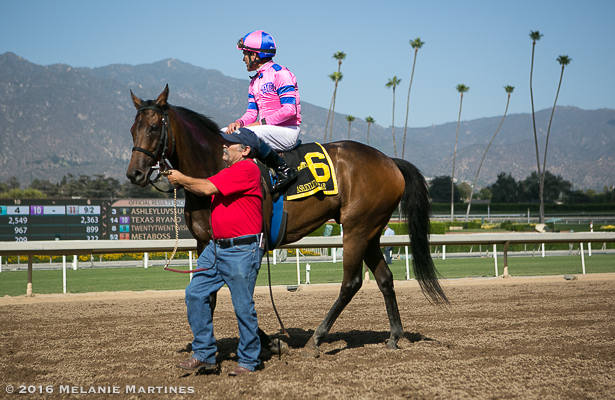 Jockey Gary Stevens and Ashleyluvssugar heading to the Winner's Circle. 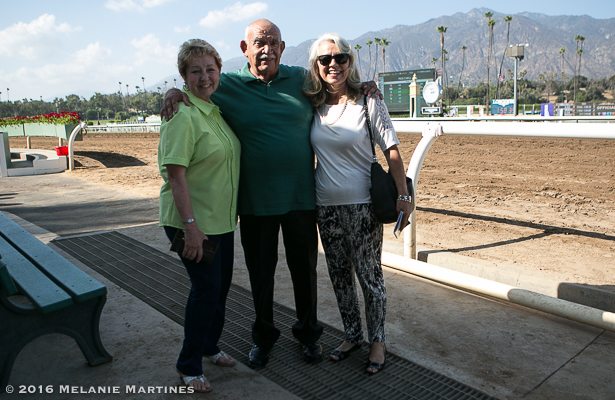 I was honored to meet John Henry's Groom, Jose Mercado. He was in the winner's circle when they presented the award for the John Henry Turf Championship. Here he is with family members. 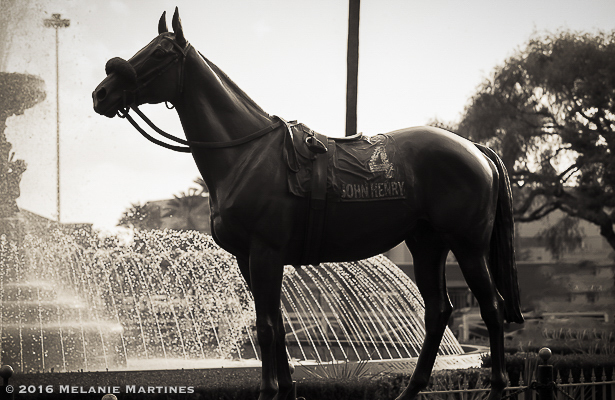 This race is named after the great John Henry. 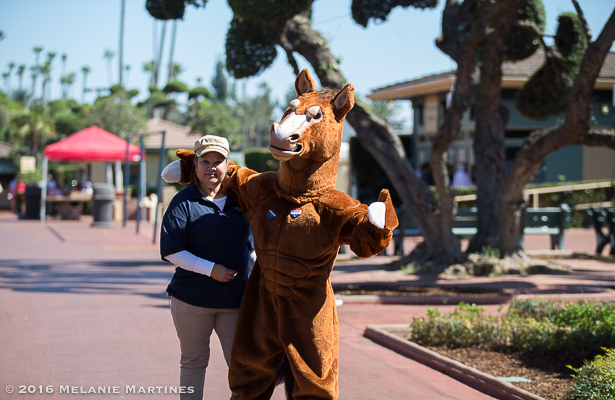 A statue is displayed at Santa Anita Park to honor him. I always pay a visit to his statue while I am at the track. It's near the Kingsbury Fountain. Race 7 had some really interesting 2-year-old fillies in a Maiden Special Weight. 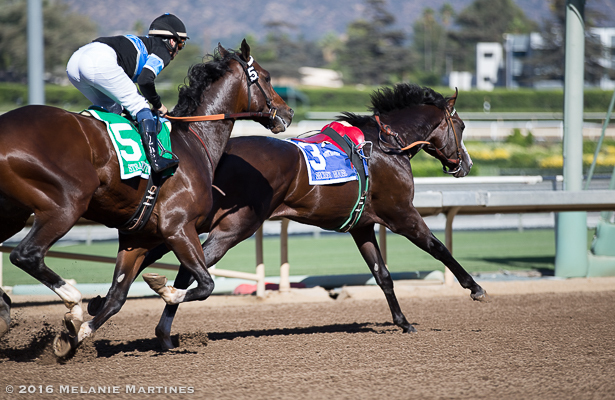 Bob Baffert had two trainees in the race, Jilly and Viva Vegas. 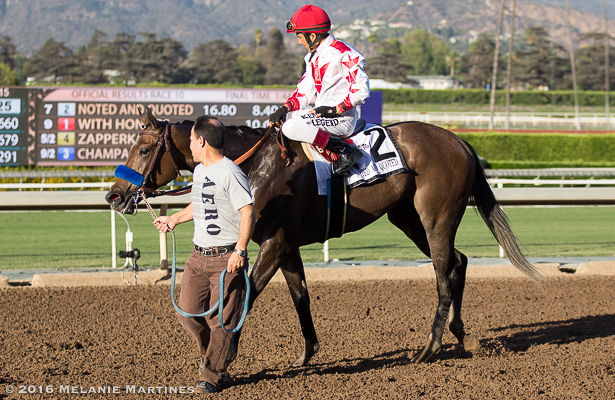 While Jerry Hollendorfer also had two trainees, Americana and Tapped. This is an interesting race to watch if you haven't done so already. Tapped and Jilly made up lots of ground at the end with Tapped from the far outside finishing up strong. Jilly came in second. She is a very striking filly. I'm sure like the others, we will see her again soon. Remember her name! What an exciting weekend of racing! 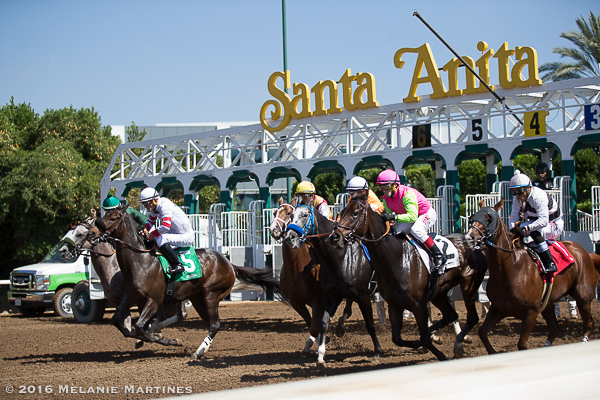 Five Grade 1 races, all part of the "Win and You're In" Championship Series. 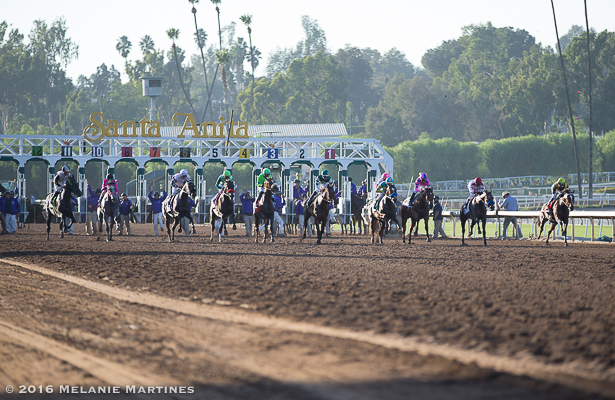 With the prep races underway, we are about a month away from the Breeders' Cup World Championships that will be held at none-other-than the GREAT RACE PLACE at Santa Anita Park on November 4-5! 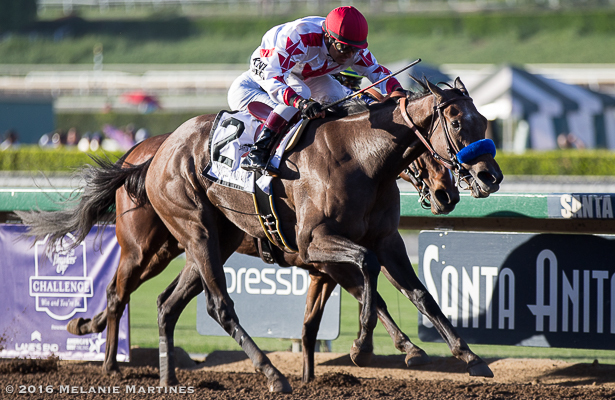 Both the Breeders' Cup Classic and the Distaff are building up to be one of the most exciting races we will see. 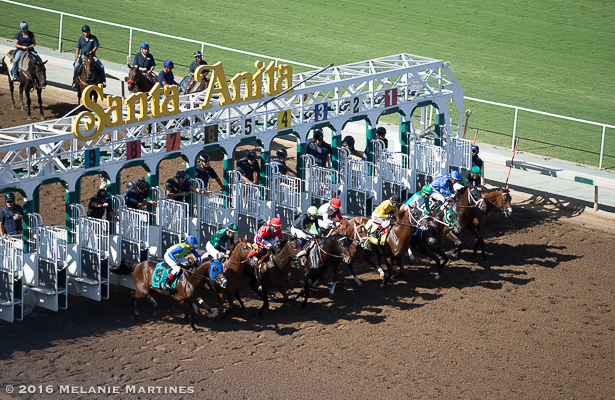 The anticipation is agonizing as top contenders from across the globe will gather at Santa Anita Park. It will be an action-filled weekend that you will not want to miss! Where will you be the first weekend in November?